In this blog post, our Director General Xavier Barcons explains how ESO works together with industry partners throughout our Member States to deliver some of the most advanced telescopes and instruments in the world. In return, this innovation has a considerable and valuable advantage to the economies of our Member States. In my last “letter” I talked about the huge range of opportunities and benefits available to ESO’s Member States. Today I’d like to elaborate on how we at ESO work with universities, research institutions and leading companies in our Member States to design and build our telescopes and scientific instruments. Astronomy is a driving force for humanity, challenging our curious minds and pushing us to make key progress here on Earth and beyond. It’s an inherently innovative discipline, using some of the most advanced technologies and sophisticated techniques available to scientists and engineers, and it constantly urges them to take one step further and come up with creative new solutions. A 360 degree panorama view of a rare cloudscape over La Silla, in the southern edges of the Atacama Desert, home of ESO’s first observing site. In order to carry out its ambitious programme of scientific research, ESO designs, constructs and operates the most advanced ground-based astronomical telescopes in the world. Unsurprisingly, the construction of such major facilities usually takes up to a decade or more. ESO has built its facilities at three observatories in Chile: La Silla, Paranal-Armazones and Chajnantor. Creating infrastructures of this size and complexity requires a massive collaborative effort between scientists, engineers and industry partners across the world. Scientific institutes in Member States participate in these massive projects, promoting and organising collaboration and giving them cutting-edge know-how — but ESO also joins efforts with a wide range of industry partners to bring ambitious projects to life. Companies in Member States can receive contracts from ESO, covering all business areas from the provision of services to technical studies to the delivery of advanced equipment. 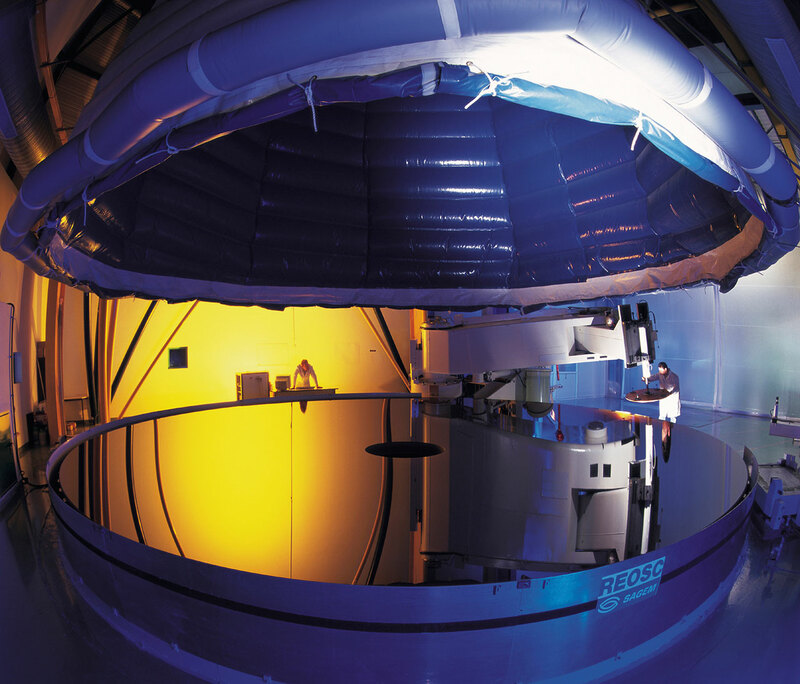 The fourth 8.2-m VLT Zerodur® mirror during the final phase of polishing at REOSC. The collaboration between ESO and industry started many years ago. One of the best known examples is the Very Large Telescope (VLT), the most advanced optical/infrared ground-based facility in the world. Back in 1988, ESO signed a contract with the German company SCHOTT to cast the four giant telescope mirror blanks from the specialised material Zerodur®. SCHOTT has now de facto become the main provider of mirror blanks to ESO. In France, a new optical facility was created at Safran Reosc for polishing the giant mirrors for the VLT, and in Italy a consortium of three companies, the AES Consortium, was formed to construct the main mechanical structures of the four 8.2-metre VLT Unit Telescopes. The fruitful VLT collaboration still endures to this day; the recently-installed Adaptive Optics Facility is a triumph of collaboration between ESO and industry. In total, over 330 million euros were spent in the ESO Member States for the construction of the VLT. Hundreds of suppliers were involved and more than 70 contracts each exceeding 500 000 euros in value were awarded, covering a wide range of industrial services, from civil works to precision electronics to large-scale glass manufacture. 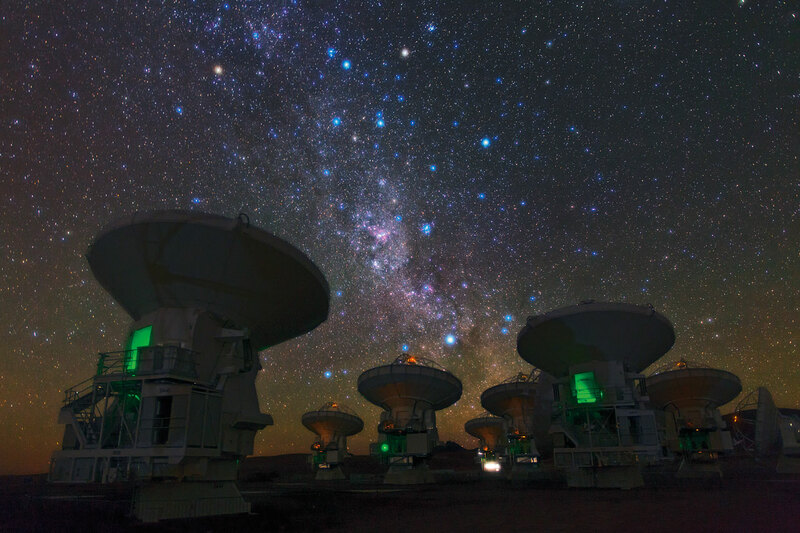 Another example of a massive and successful collaborative project is the Atacama Large Millimeter/submillimeter Array (ALMA), a 1.3 billion euro project between ESO, North America, and East Asia. ALMA is a giant telescope composed of 66 high-precision antennas; North America provided 25 of these antennas, East Asia 16, and the remaining 25 were provided by ESO. The ESO antennas were manufactured by the European AEM Consortium, led by French, Italian and German companies participating under a nearly 150 million euro contract, one of the largest ever European industrial contracts for ground-based astronomy. The Extremely Large Telescope (ELT) is ESO’s current major project, with a budget of 1.15 billion euros. This 39-metre optical/infrared telescope will dwarf all other telescopes. ESO signed the contract for the ELT dome and telescope structure with the Italian ACe Consortium, consisting of Astaldi, Cimolai and the nominated sub-contractor EIE Group. This is the largest contract ever awarded by ESO and also the largest contract ever in ground-based astronomy worth an approximate value of 400 million euros. SCHOTT is again casting the telescope’s mirrors, Safran Reosc will polish the mirrors, the SENER Group will supply the mirror cells, and the FAMES consortium — composed of Fogale and Micro-Epsilon — will provide the edge sensors for the 798 hexagonal segments of the primary mirror. Of course, this is not the end of it; there is still a large number of industrial contracts that need to be placed for the ELT, and so further opportunities for European industry will be available in the coming years. Furthermore, the ELT will be equipped with a wide variety of instruments that will be developed and built by our Member States institutes and companies. Participants in the ELT contract signature ceremony at ESO Headquarters on 18 January 2017. The picture shows representatives of teams involved, both from SCHOTT, the SENER Group and the FAMES consortium, and from ESO. But ESO’s telescopes and instruments aren’t the only ones to benefit. ESO’s projects involve staggering technology and continuous innovation and knowledge gain, offering possibilities for technology and knowledge transfer. Since the science and engineering of these huge astronomical projects is cutting-edge, most of it must be developed from scratch — creating opportunities to start new companies, boost high-skilled employment, and generate substantial added value to our Member States’ economies. Companies working for ESO’s demanding projects often need to develop new skills and capacities; these challenges become assets of the companies afterwards, expanding their business opportunities. ESO also sets new global benchmarks for size, accuracy, capacity, speed and efficiency of optics, mechanics, sensors, lasers, computing, communication, construction, logistics and other important fields. ESO’s projects offer a clear showcase for industry. They benefit our Member States, our industry partners, the scientific institutes working with us, and even society as a whole. To name just two simple, concrete examples, a broad range of dental treatments stem directly from laser developments in astronomy, and adaptive optics technology in telescopes has been implemented in microscopic techniques to improve resolution and contrasts, as well as in instruments for ophthalmology enabling sharp imaging of the retina. Cerro Armazones in the Atacama Desert, near ESO’s Paranal Observatory, at sunset. Cerro Armazones is the selected site for the ELT. Over the last 10 years, ESO has spent 1.3 billion euros on industry contracts, with two-thirds of that value spent directly in ESO Member States. Without those collaborations we would never be able to build our facilities. We’re proud to forge this path of international partnership and will continue in all our future projects, producing ground-breaking and innovative science and technology that everyone can benefit from. Xavier Barcons became the eighth Director General of the European Southern Observatory on 1 September 2017. He was born in Spain in 1959, where he graduated with a PhD in physics in 1985 from the University of Cantabria. Prof. Barcons is a specialist in X-ray astronomy, and in his research career he has (co-)authored more than 250 refereed papers in journals and conference proceedings. He served as an ESO Council member for eight years, including as President (2012–2014), dedicating significant efforts to ALMA and ELT. 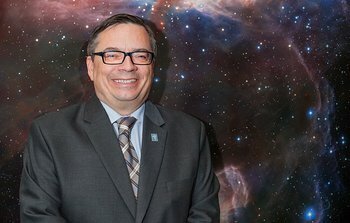 Letters from the Director General share thoughts and views from ESO’s Director General on the ESOblog. Find more blog posts from guest bloggers and interviews with astronomers on the ESOblog here.